It was great news for many a few years ago, when research began to tout the health benefits of chocolate. Its antioxidant properties delivered redemption to chocoholics near and far — no matter that the health-giving potential was only linked to certain types of chocolate. Well, of course the piper has to be paid: While research is showing that cocoa does indeed have health-giving properties, damage can be done if you eat too much of the high-fat, high-calorie variety. The result is still excess pounds and the higher risk of disease that accompanies them. The key, as with so many of life’s pleasures, is moderation. Studies demonstrate that tiny nibbles of dark chocolate — the type of chocolate that is richest in disease-fighting antioxidants called flavonoids — can increase blood flow, help artery function, lower blood pressure and boost brain function. To learn more, I spoke with San Francisco nutritionist and wellness coach Rania Batayneh, MPH (www.essentialnutritionforyou.com). She re-affirmed that cocoa beans — like red wine, tea, grapes, pomegranates, acai berries, cranberries, strawberries, apples and many other fruits and vegetables — are excellent sources of flavonoids. A small study at Yale Griffin Prevention Research Center concluded that dark chocolate supports cardiovascular health by improving endothelial function and blood pressure. Additionally, other research has shown that flavonol-rich cocoa and chocolate act similarly to low-dose aspirin, notes Batayneh. The flavonols in cocoa also activate nitric oxide synthesis in the arterial wall (which is necessary for optimal blood flow and blood pressure) and prevent triglycerides in the bloodstream from oxidizing, forming plaque and clogging the arteries, thus reducing the risk of stroke and heart attacks. Studies show that cocoa powder, dark chocolate and milk chocolate have even higher Oxygen Radical Absorption Capacity (ORAC is a measurement of antioxidant power) values than antioxidant stars such as prunes and blueberries. If a little is good, a lot may be better — right? If only. Portion size is critical, says Batayneh. 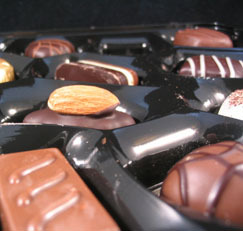 Though dark (including bittersweet and even semi-sweet) chocolate definitely is higher in flavonoids than milk chocolate and hence is healthier, it also has lots of calories and should be savored in small quantities. In no way does this research condone regular indulgence in hot fudge sundaes and chocolate cake. Steer clear of milk chocolate products. When manufacturers add milk they remove some cocoa, consequently reducing the amount of healthful flavonoids, which have a bitter taste… while also adding more unhealthful ingredients such as sugar and milk fat. A great way to boost antioxidant intake is to pair a one- or two-ounce piece of dark chocolate (look for a cocoa content of 65% or better) with a mid-afternoon cup of straight green tea for a double-dose of flavonoids. Balance out the extra calories by eating less at lunch and dinner or taking a brisk walk.